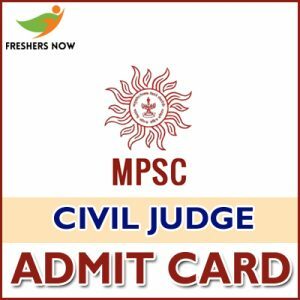 MPSC Civil Judge Prelims Admit Card 2019 Is Released by the officials of the Maharashtra Public Service Commission (MPSC) and they have decided to conduct the MPSC Civil Judge Prelims Examination 2019 on 7th April 2019. Whereas the Mains Exam on 18th August 2019. Moreover, candidates who have applied for the post of Civil Judge must and should download their MPSC Civil Judge Prelims Admit Card 2019. Furthermore, there are 190 vacancies for the post of Civil Judge and aspirants should download the admit card before the examination. You can download the admit card using the link mentioned at the bottom of this article. This article provides you with detailed information about the admit card, selection process, mandatory documents. This is good news for the aspirants applied for the Civil Judge post. The officials of Maharashtra Public Service Commission planned to conduct the MPSC Civil Judge Examination 2019 on 18th August 2019. Moreover, aspirants need to download the valid admit card to attempt the exam. Prelims Exam Date is 7th April 2019 which is assigned by the officials through their website. As soon as the officials release the admit cards, we will notify it through our article. Also, we have mentioned the recruitment link for the MPSC Civil Judge. Refer to the coming sections for further information. Coming to the selection process, it is comprised of two rounds. First is the written test. Only the eligible candidates who receive the admit card should write the written test. Then, the candidates selected in the written test will be shortlisted. Later on, the shortlisted aspirants should face the interview round. Then, the final list of selected candidates will be recruited and promoted to the training. The most important task for the aspirants after downloading the hall ticket is to check the details. Moreover, the details present on the hall ticket should be correct. If any of the information is wrong, then aspirants need to resolve them by reporting to the higher authorities. The information available on the hall ticket may be in the same fashion provided below. Candidates about to attend for the MPSC Civil Judge Examination 2019 should refer to this section for sure. To attend for the examination, aspirants need to download the hall ticket. Moreover, along with the hall ticket, candidates should also carry some mandatory documents to the exam. These mandatory documents will serve as the identification proofs at the time of the verification process. The list of the documents is as follows. In this article, we provided the download steps for MPSC Civil Judge Hall Ticket 2019. Aspirants who find difficulty in downloading the admit card through online can refer to this section. Note down the points carefully and download the admit cards. First, candidates should visit the official website of Maharashtra Public Service Commission i.e., mpsc.gov.in. Then, the home page of the website will be displayed on the screen. Now, go to the recent news or announcement section. In that section, you can find recent notifications. Search for the MPSC Civil Judge Hall Ticket 2019. Then, make a click on the link. Fill the details in the required fields Like Username and Password. Check the details once again and click on the submit button. Then, download the MPSC Civil Judge Prelims Admit Card 2019. Do not forget to take the xerox copies of the admit card. We hope that the information provided in this article is useful for your reference. For any further information about the Maharashtra PSC Civil Judge Admit Card 2019, you can visit the official website mpsc.gov.in. If you have any queries, you can ask us at freshersnow.com.